In South Africa most of the wine varieties we’re familiar with are French. We’re no strangers to pronouncing “saw-vee-nyon-blahnk” or “pee-no-nwar”. But Italian varietals are increasing in popularity and names like Nebbiolo and Zinfandel are appearing as part of the repertoires of various wine estates. So we decided to focus this post on the most widely grown varietal in Tuscany, the one and only… Sangiovese. Named after the Latin sanguis Jovis, meaning “the blood of Jupiter”, this varietal is perhaps most well-known for its contribution to famous blends like Chianti. But it is also a renowned wine in its own right – already well known as far back as the 16th century. More or less fourteen clones of Sangiovese exist, resulting in great variations in wines produced from – seemingly – the same cultivar. A study published in 2008 used DNA to establish that Sangiovese is closely related to ten other Italian varietals, but that in all likelihood, it was a parent of all of these. Sangiovese is able to adapt to its surroundings – changing its genetics to suit the environment it’s growing in. It has been shown to thrive in both limestone and shale-clay in Italy and, in other parts of the world, it adjusts in accordance with the exact composition of the soil and farming methods used. It is drought resistant and because it requires little to no irrigation, it is perfectly suited to dry land farming. Described by some as a “savoury” wine, Sangiovese can posses a whole range of flavours depending on the surroundings it grows in. Some call it the “chameleon” of the Italian varietals! It can range from being quite fruity, all the way to having strong earthy, leathery or even farm yard notes. What everyone agrees on, though, is that it almost always exhibits characteristics of cherry. But other fruity flavours in the mix include plums, mulberries, black currants and even tomatoes. A great Sangiovese is well-balanced with strong tannins and good acidity, allowing it to age well. How popular is it in South Africa? Only a tiny amount of Sangiovese is currently grown in South Africa with about 63 hectares being cultivated, and this is done mostly in the Stellenbosch and Darling regions. Interestingly enough, records show the oldest Sangiovese vineyard was planted on the farm Boplaas, only in 1982. That makes it a relatively new cultivar to South Africa. 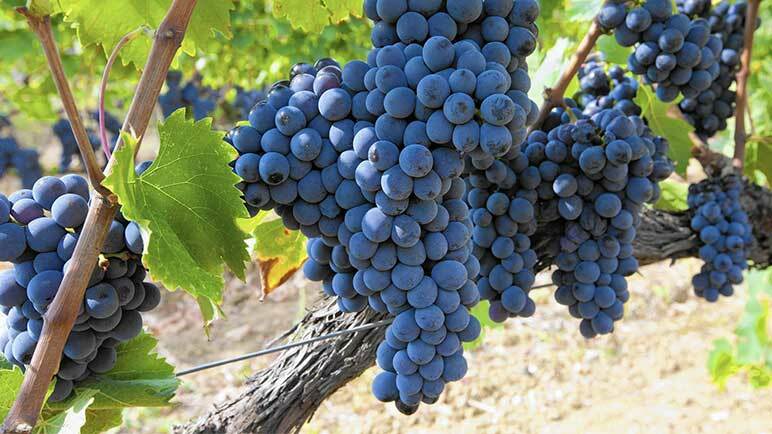 But its popularity is steadily increasing and currently about 10 wineries make Sangiovese. It is used a little differently in SA than in Italy – here it is used to make dry red wines. It is still predominantly used as a component of blends (often blended with Cabernet Sauvignon and Merlot), but the trend is moving towards producing it as a respected single varietal. Have you tried our Satyricon Sangiovese? Drawing on a work of satirical fiction from the early days of the Roman Empire, La Vierge’s Satyricon Sangiovese tells the story of a journey into lust, love and temptation in order to attain knowledge and wisdom. If this sounds like the type of adventure you might like to go on yourself, then we recommend you start with a glass of wine in your hand. A fantastic example to showcase the well-balanced tannins and acidity of Sangiovese, this beautiful wine can either be enjoyed right now or aged for a few more years. Open up a bottle brimming with tea leaf flavours, the characteristic cherry flavours Sangiovese is so well-known for, but also abundant plump red fruits and a slight spiciness. Come take in almost 360° views of the Hemel-en-Aarde Valley from our beautiful delicious meal at our restaurant and enjoy a game of boules on the patio. If you need more info, about the Tasting Rooms or about the range of La Vierge Wines, get in touch with us today!